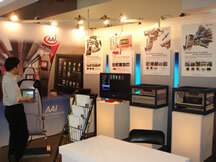 2011.02.01 AAI announce AAIBEST (AAI Bus Entertainment System Technology) at Istanbul, Turkey to be the AAI bus product distributor at Turkey. 2011.01.15 AAI and Volo TV (www.volo.tv) announced finish the whole fleet entertainment carriage installation for First Great Western at UK. 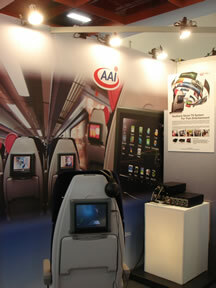 2010.09.21 InnoTrans 2010: AAI present the fleet management VOD entertainment system for train carriage at InnoTrans 2010. Aerovision Avionics, Inc. (AAI) was incorporated in 1997 to pursue business in the area of avionics and in-flight entertainment (IFE). 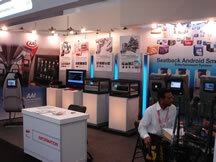 AAI is an ISO 9001 certified company located in the Science-based Industrial Park in Hsinchu, Taiwan. Currently, AAI has six departments, i.e., Sales & Marketing, Research & Development, Operations, General Administration, Quality Assurance, and Safety & Health. 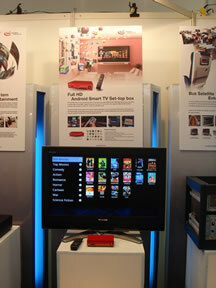 © 2011 AeroVision Avionics Inc. All Rights Reserved. 2F, 30, R&D Rd. II, Science-based Industrial Park, Hsinchu, Taiwan.